Grace Bay Beach is a spectacular setting for a destination wedding. Photo by Brilliant Studios. 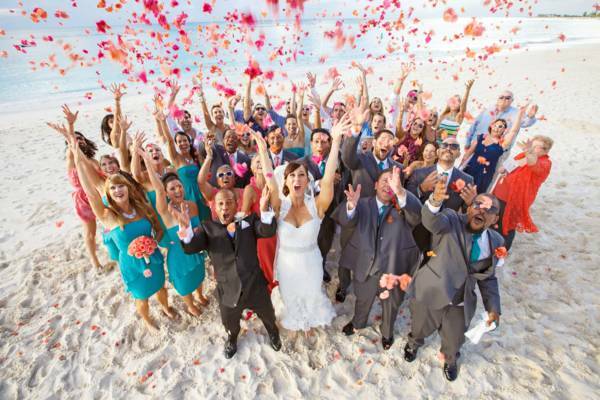 The Turks and Caicos is a perfect tropical wedding destination, and offers a great range of venues and services. Photo by Brilliant Studios. The Turks and Caicos is an incredible tropical destination, and there’s a great collection of romantic resorts that are perfect for a wedding or honeymoon. Depending on preference, most resorts are typically able to host the wedding ceremony on the beach, in an outdoor courtyard or garden setting, or indoors. Check out Top 10 beaches in the Turks and Caicos for great information on possible coasts for ceremonies and photo shoots. The elegant Point Grace resort is located on a quiet yet centrally-located stretch of Grace Bay Beach. This picturesque and romantic retreat offers a classic Caribbean resort atmosphere, without the hustle and bustle of the larger resorts. Point Grace features 28 rooms and penthouses, the Grace’s Cottage restaurant, and a spa. Keeping with its graceful image, the resort maintains a classic 1958 Rolls Royce Silver Cloud car for VIP transport. The resort offers wedding packages, and is happy to help plan your special day. The Colonnade Pool at the Shore Club. The Shore Club resort on the turquoise waters of Long Bay Beach on Providenciales is one of the country’s newer luxury retreats, and offers beautiful rooms and villas, several dining and bar options, a spa, a few great event venues, and four beautiful pools. The Shore Club is part of the Hartling Group of resorts, which is represented by an extensive local professional team, including event planners and a great range of catering, butler, and florist support. The exclusive and luxury Amanyara is found on the remote and highly scenic Northwest Point Marine National Park on the west coast of Providenciales. This resort is part of the international Aman group, and Amanyara keeps with their theme of a luxurious low key atmosphere that fosters wellbeing. On site are restaurants, a spa, exceptional service, and great outdoor amenities, completed by a serene natural ambiance. The professional team at Amanyara is happy to help plan the perfect bespoke event. The beautiful beach at the Grace Bay Club. Grace Bay Club is one of the oldest luxury resorts in the Turks and Caicos. Today this exquisite resort has expanded from the original boutique hotel to a collection of three resort enclaves, three restaurants, two bars, a spa, and several pools. Wedding packages can accommodate groups from just the couple to 120 guests, and the resort’s event planners will help to arrange every aspect of the special day. The eye-catching Seven Stars resort is located on a central and prime stretch of Grace Bay Beach. This 115 room hotel brings together elegance and amenities. The resorts features an amazing pool, two restaurants, and a great complement of things to do. Seven Stars coordinates custom wedding packages, which may include everything from catering and beverages, to helping with the licenses and officiation. The boutique Beach House resort on Providenciales. The small and exclusive Beach House is an adult-only resort located at the tranquil Bight Beach on the west side of Grace Bay. This boutique luxury hotel is a great location for those seeking a quiet and sophisticated atmosphere. The Beach House is part of the Turks and Caicos Collection, which includes Blue Haven Resort and Alexandra Resort, and brings together a wealth of shared amenities, services, and staff. Onsite at Beach House are several dining and bar options, Elevate Spa, and a great complement of amenities. The resort offers wedding packages, which includes the ceremony and officiant, music, photography services, décor, catering and a wedding cake, and more. The exclusive COMO Parrot Cay Resort, located on the private island of Parrot Cay, is another beautiful location for a wedding, and was in fact the site of several celebrity weddings. Parrot Cay has long been a retreat for the rich and famous, starting with Count and Countess Czernin in the 1950s. Like its neighbouring cays, Parrot Cay boasts of a spectacular beach on its north coast. Parrot Cay resort amenities include a spa, yoga retreat, two gourmet restaurants, and a great collection of water sports equipment. The resort is accustomed to catering and fine dining; from large events to a romantic couple’s dinner on the beach. The exquisite beach at Pine Cay and the Meridian Club. The exquisitely-situated Meridian Club is often overlooked, largely due to its location on the private islands of Pine Cay. This small yet select resort stands on one of the finest stretches of beach in the Turks and Caicos, with perfect white sand, calm turquoise water, and absolutely no crowds. Pine Cay is a quick hop by boat from Providenciales, and the Hemmingwayesque atmosphere of life on the island is something that’s now quite rare throughout the globe. Accommodation options on the island include the small luxury resort itself, and the many quaint vacation rentals dotted around the cay. The Meridian Club can help to arrange all aspects of the wedding, from catering, to the ceremony and photography. The premiere Palms on Grace Bay Beach is another great wedding option, with a great beach location and beautiful resort grounds. The Palms is well-versed in event hosting, with professional staff, a great range of indoor and outdoor venues, gourmet dining and catering options, and access to a full complement of support services such as photographers, designers, and florists. The expansive Beaches Turks and Caicos all-inclusive resort can be a great wedding option when families and kids are attending. The resort features an incredible selection of things to do and dining options. Beaches Turks and Caicos is part of the international Sandals resort group, which is certainly no newcomer to creating amazing Caribbean weddings and honeymoons, and offers a full complement of packages for wedding and vow renewals. The resort has many options, to allow the bride and groom to carefully tailor the décor, dining, music, ceremony, and guest activities of their wedding in the Turks and Caicos. Incredible rental villa with private beach at Turtle Tail on Providenciales. Another option for a destination wedding in the Turks and Caicos is one of our larger luxury villa rentals. There’s a great collection of beachfront options to choose from, including smaller and secluded rentals, to expansive 10 bedroom mansions. Villas can be a good choice for those wanting to get more involved in the planning and overseeing of all details of their event. The local professional wedding planners are also happy to work at vacation rentals as well.